Over the last few weeks our yellow squash in the garden has started producing. And when I say it’s started producing I mean seriously. Last weekend I was able to pawn off a large box full of squash on my visiting family but each day there is more and more. 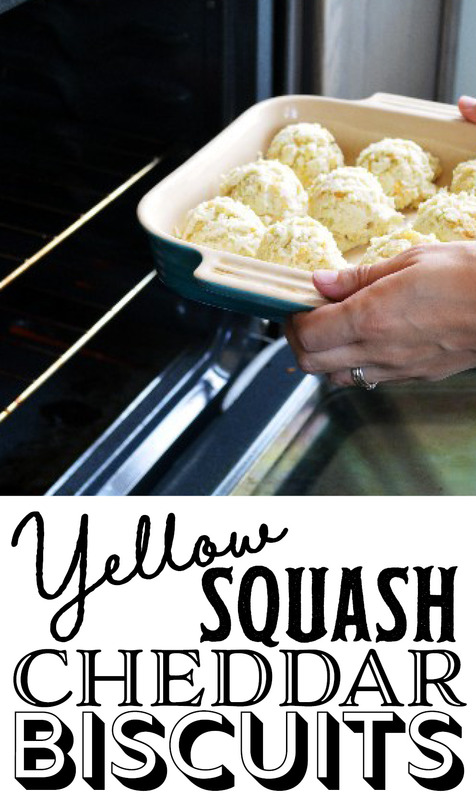 We love yellow squash but sometimes it’s hard to keep up with eating it at every meal. Sometimes you want something new and fresh! But of course, you don’t want your garden veggies that you worked so hard on to go uneaten. This week I’ve been experimenting with baking with yellow squash and I’m SO happy with the results! I’ve made some delicious baked goodies and treats that have been a huge hit with my little family. And the best part is, you really don’t even know that they yellow squash is in the recipe. It’s like a veggie bonus! 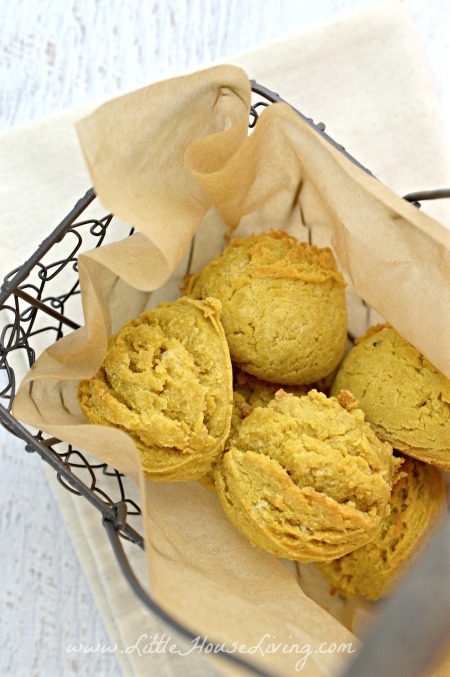 This Yellow Squash Cheddar Biscuit recipe is one that has gone over really well. These make an excellent side dish for grilled meats or even a great side for a garden fresh chef salad. Or you can just munch on them for a late night snack if you have a cheese craving! No matter how to decide to enjoy these I hope you do it soon! Start by gathering ingredients. I used fresh yellow squash from the garden but if you want to make this in the winter you can use frozen, shredded squash. You could also use zucchini if you don’t have yellow squash. Mix together all the dry ingredients. 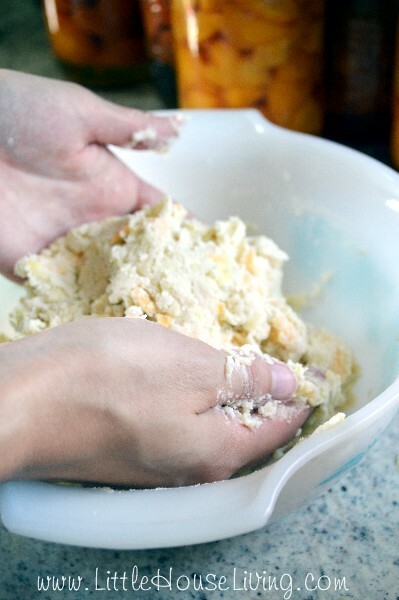 Add in the shredded squash and stir until coated with the dry ingredients. Add in the remaining ingredients and mix together well. I used my hands to make sure I didn’t leave any clumps in the dough. 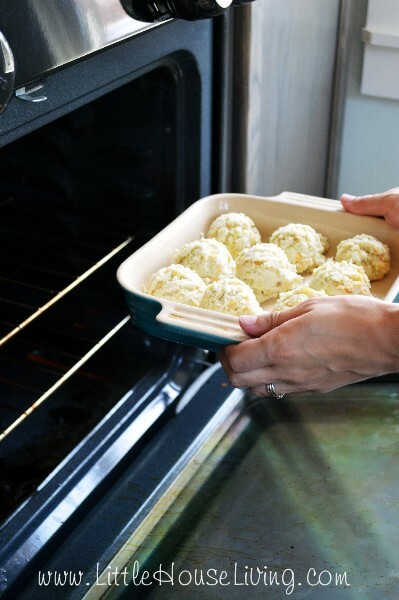 Drop with a large cookie scoop into a lightly greased 9×13 baking dish or two 8×8 baking dishes. You should place the biscuits fairly close together. 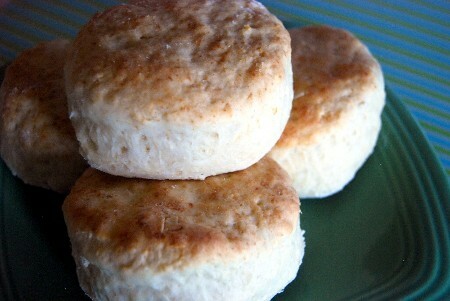 Stick the biscuits in the oven at 400 degrees for about 15 minutes (20 minutes for gluten free). The biscuits will be brown on the top. Enjoy with a nice slice of butter spread over the top. YUM! If you are looking for other biscuit recipes you might want to check out these Cream Biscuits or these Baking Powder Biscuits. Both are great! And you can find more yummy recipes using fresh garden produce on the Using the Garden Veggies page! 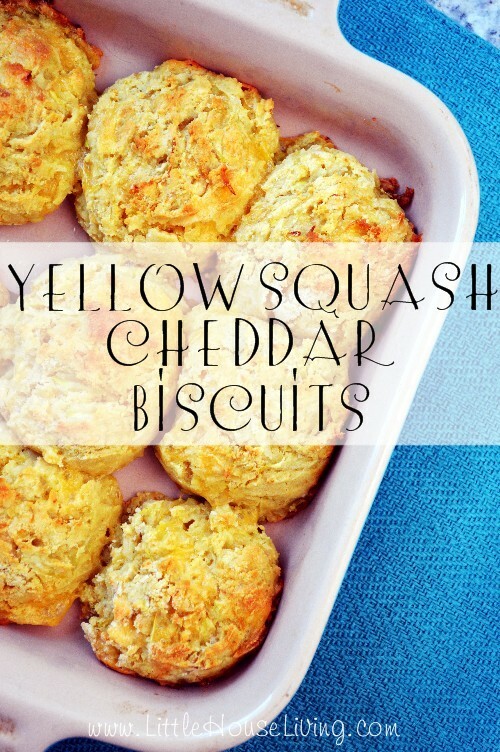 What else are you going to enjoy with your homegrown yellow squash this summer? 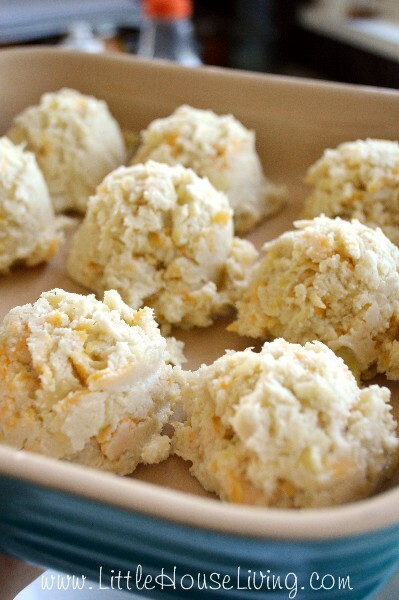 These look delish, but I don’t see how much cheddar you used. Could you please tell me? I have a crazy amount of summer squash too. I will definitely be using this recipe! How much cheddar should be used? How much cheddar chse does the recipe call for? These look amazing! I’m going to try them out this weekend! Thanks! These muffins look wonderful!! Thanks for sharing. Can’t wait to try this. How many does this recipe make …?? I am trying these for sure,last year we had an abundance of everything,I called a seniors building that provided congregate meals & asked if they would like,she said anything you can bring we can use. After that what we didn’t use or friends/neighbors,we took to them them,& I canned & froze stuff, there is more than enough for us. How would substituting sourdough work? Oh my goodness – these look SO good! We definitely have an abundance of zucchini and yellow squash, so I’ll have to work these biscuits into my menu plan soon. Pinning! 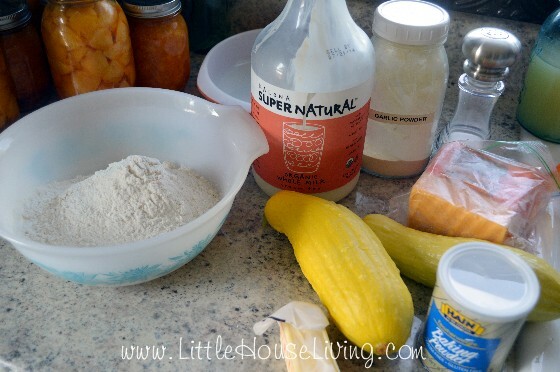 I’ve never tried baking with yellow squash. Can’t wait to try and hopefully the kids love them! We avoid wheat, most grains. I wonder if Almond flour would work as well in place of gluten-free flour? It seems to in most non-yeast recipes. Yes, I think it would work fine in this recipe. This is so smart! I make a basic squash and cheese casserole that ends up tasting similar to mac and cheese, but I never considered adding it to a buscuit base. This just got me thinking about all kinds of ways to use squash. I found you on the Frugal Crafty Home Blog Hop (I’m # 141 & 143). Super sharp! These look so darn good! 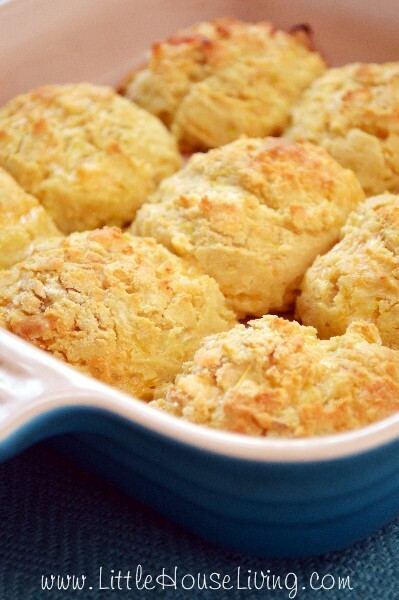 Thanks for the details of how to make the biscuits…I am pinning this to hopefully make soon. I saw your post over at Masterpiece Monday blog party. These look great!! !…just 1 question before I try 🙂 Curious if you let the squash sit prior to mixing to release some of its water or did you use is freshly grated straight into the dry mix? I used it fresh grated 🙂 If you are using it from the freezer you would want to let it sit first. Thanks for sharing at Wednesday Whatsits. I am always looking for new ways to use my summer squash. Yum! What a great recipe. Those biscuits look incredible. Thank you for linking at the In and Out of the Kitchen Link Party. Hope to see you again next week. I love your recipe ideas you come up with, but is there any printer friendly version available? i would love it for my meal planner. There is a green Print button at the bottom of each post that you should be able to use to print the recipe. I’m so glad everyone enjoyed the recipe! We love yellow squash. I am always so happy to have it in abundance. But then winter comes and it is so hard to find. I was wondering, can you freeze squash? Looks amazing! Must try soon and trick my family! You can give it a try. I haven’t tried just brown rice flour yet but it might work. If you do try it let us know! These tasted ok but couldn’t get past the overwhelming flavor of baking soda/powder….was the 1 T a typo? It ruined an otherwise great recipe. That amount is correct, we didn’t seem to notice it at all in our biscuits… as your soda or powder older by chance? You could try adding less, they just won’t rise as much. I’m assuming you peel the squash first, of course I have it frozen in slices without it being peeled! But do they need to be de-seeded before grating? I do peel first, you don’t have to though if you don’t want to, although with squash you might be able to tell it’s in the biscuits if the peel is on. I don’t de-seed unless they are really large. I tried your recipe tonight and it was good. I already had some cooked spaghetti squash, so I used that. I don’t know if having it already cooked made any difference or not, but it was a good way to use up what was in the fridge. I also used whole wheat flour, but next time I think I’ll try regular flour or maybe even almond flour. I think more garlic powder would’ve been better in mine. I made only half a recipe since it’s just my husband and I. The surprising thing about them, though… my husband actually ate them… and liked them! I didn’t tell him there was squash in them. 😉 He doesn’t do veggies… at all… that he knows of anyway. Heehee! Thanks for the recipe. Why did you peel the zucchini/squash before shredding? My family prefers it that way. Made these today to serve with homemade potato soup & chili. They were a big hit! I will definitely make them again. I love your website! Thanks for all of the hard work that you do in putting it together. I’m so glad your family enjoyed the recipe! 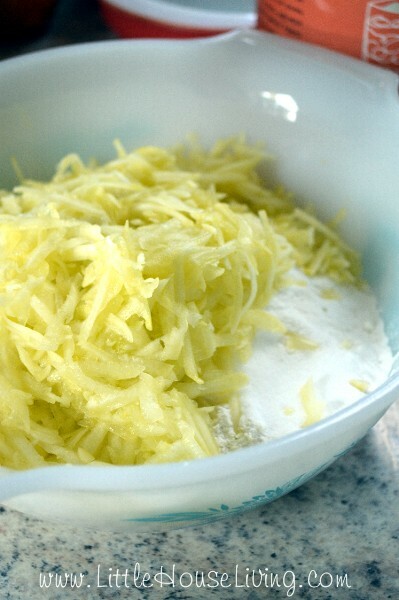 wondered if you have tried shredded acorn or other squash’s. because that is what i have excess of. thank you! I haven’t but I think that might be really yummy! I made these for dinner tonight and served with barbecue chicken and green beans. I didn’t peel the squash, and I added 1/2 teaspoon of cayenne pepper because I knew the guys would like it. They loved these biscuits! Hubby is looking forward to a couple of the leftovers for breakfast. Hi…this recipe looks so good but I’m wondering if you can make it with pumpkin. As squash is hard to find here? Yes, I think you should be able to make it with pumpkin. What a wonderful and different way to use up summer veggies! 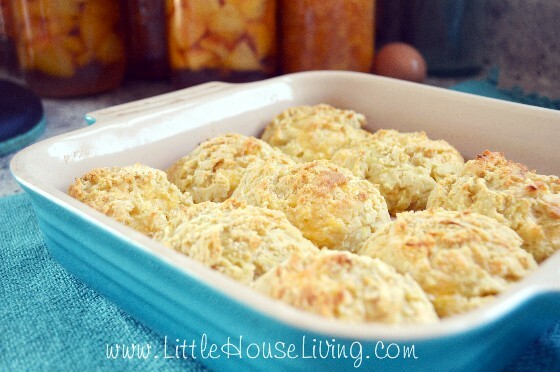 I have some freshly shredded summer squash in my fridge right now that I think is destined to be turned into these delicious sounding biscuits! Thanks for sharing at What’d You Do This Weekend?! This recipe sounds & looks amazing! I’m a super squash lover, so I am excited to try this! Thank you so much for linking up to Merry Monday this week! You are my featured pic of the week! I am sharing your post today on my blog & social media! We hope to see you next week for another great party! Have a great week! We’re into that part of summer where my whole family is sick of squash and zucchini, but I made these and they disappeared- everyone asked me to make them again, and were thrilled we still have zucchini to do it with. I did have to increase the cook time by 10 minutes, but that is probably just my oven. So glad to hear that it was a crowd pleaser, Grace!! Be sure to check out our recent post (https://www.littlehouseliving.com/100-delicious-zucchini-recipes.html) for 100 Zucchini Recipes! That should give you some great ideas for your leftovers! Thanks for stopping by. Made these last night. They were just OK, BUT my 9 y.o. daughter did not realize they had yellow squash in them and ate two, so that part was a success. Maybe they’d be better with buttermilk? Made these with parmesan instead of cheddar and they came out great! I baked these last night. Literally some of the best biscuits I have ever eaten! I may never eat yellow squash any other way. Awesome, I’m so glad you enjoyed them! Awesome recipe!! I will try this soon. 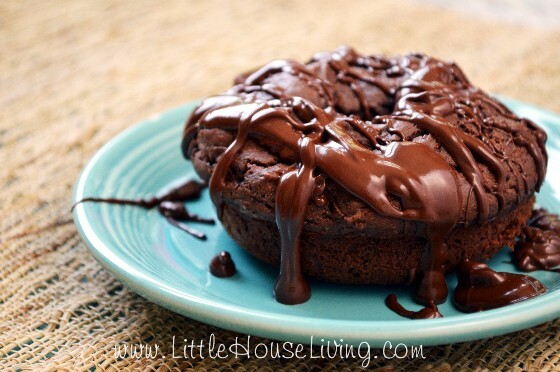 Please keep sharing more delicious recipes like this one, especially cookies. Thanks a lot!! The baking soda tasted too strong in this recipe. If I make it again, I might would try and use only half of what the recipe states. I made these for dinner tonight and my family enjoyed them. I used sharp cheddar instead of cheddar cheese – just because that is what I had in the fridge. I would definitely make them again. I actually froze a few leftovers and look forward to enjoying these muffins in a few weeks 🙂 Thank you for sharing! Beautiful post along with ace information about how to making cookies, i really love cookies and biscuits. i lot of learn from your post and i want to know some more. please keep sharing some mare recipes like this. thank you. Are the nutritional stats available for this recipe basically caloric? I loved these!!!!! I froze half since I live a lone. I added some pepper to mine think next time may add a touch more milk. Great veggie recipe. @merissa first thanks for sharing such tasty post.. and I’m going try this at home.